제주 = 나는 믿을 수 없었다. 지난 10년 동안 경치 좋은 제주도 남부 해변에 해군기지가 건설되는 것을 반대하는 데 앞장서온 덕망 있는 천주교 신부의 입에서 어떻게 성난 말들이 그렇게 쏟아져 나올 수 있는지. 문정현 신부는 제주대에서 열린 3일 간의 ‘평화 아카데미’에 참석하고 제주도 강정마을을 방문한 외국인 교수들과 학생들 사이에 있던 나를 보자마자 “CIA(미국 중앙정보부), 당신은 CIA 요원이다”라며 “CIA, 나가라, 꺼져라”고 소리쳤다. 이 신부의 아우성은 내게 충격과 당혹감을 줬을 뿐 아니라 도무지 이해할 수 없는 것이었다. 나는 5년 전에 그를 만났다. 당시 나는 일본 최남단 섬 지역과 한국 남부 섬에서 벌어지는 반(反) 해군기지 운동을 비교하는 내용의 <오키나와와 제주: 불만의 기지들>(Okinawa and Jeju: Bases of Discontent)라는 책을 쓰고 있었다. 당시 그는 내 질문에 기쁘게 대답했고 그 후 2, 3차례 더 그를 만났다. 하지만 지금 그는 나를 적으로 보고 “CIA, CIA”라고 외치면서 3, 4대의 순시선들이 유람선들 사이에 정박해 있는 해군기지 옆에서 열린 워크샵에서 나보고 나가라고 명령하고 있었다. 그는 매일 기지 정문 밖에서 시위를 주도하면서 내가 방문자들 가운데 있는 것을 봤을 때는 자신의 투쟁을 상징하는 돌 형상을 조각하느라 바빴다. 내가 그런 비난을 받을 만한 일을 했거나 그런 글을 썼던가? 내 책에서 그를 공격하는 내용은 전혀 없다. 나는 그가 내 책을 읽기나 했는지 궁금하다고 그에게 말했었다. 그는 읽지 않았다. 그를 화나게 한 것은 내가 신문에 기고한 칼럼이었다. 나는 제주 해군기지가 건설되는 것을 막겠다는 시위가 그 목적을 이루지 못했다고 인정하는 그의 말을 인용했고, 그에게 그가 늘 주장해왔던 것처럼 미군이 제주 해군기지에 있다고 정말 믿는지 물어봤는데 그것이 그를 매우 화나게 했다. 그는 미국을 ‘악의 축’이라고 비난하면서 내 질문에 대답했다. 무엇이 이 성직자로 하여금 사실에 근거하지도 않은 채 함부로 독설을 내뱉는 사람이 되게 한 것인가? 어떻게 그는 기도에서 정치 선전을 하는 사람으로 그렇게 쉽게 바뀔 수 있는가? 거짓 증언을 하지 말라는 십계명의 9계명은 무엇인가? 문 신부는 이 성경의 계율을 잊어버린 것인가? 아니면 그는 운동가로 자신의 목적에 맞지 않는 것 같은 성경의 가르침에서 자신은 예외라고 보고 있는 것인가? 내가 다시 문 신부를 만난다면 그와 협상 혹은 대화를 하려는 나에게 다시 소리치며 비난만 쏟아 부을 것이다. 협상과 대화는 북한을 어떻게 상대할 것인지 방법을 운운할 때 자주 등장하는 두 단어다. 하지만 유감스럽게도 화해를 하려는 진지한 시도는 실종되어 있다. 이 성직자의 태도는 좋은 결과의 기미가 보이지 않는 오랜 투쟁에 아무 생각 없이 정치 선전을 선호하는 골수 운동가들과 타협을 이루는 데 장애가 된다. 우리는 북한이 한국전쟁을 공식적으로 끝내는 평화협정을 체결하고 싶어 한다고 들어왔다. 하지만 북한은 미사일과 핵프로그램을 절대 포기하지 않을 것임을 분명히 하고 있고, 김정은은 직접 만나자는 문재인 대통령의 제안에 어떤 반응도 보이지 않고 있다. 이 골수 운동가들의 비타협적인 태도는 수백만 명을 위협하면서 엄청난 돈을 쏟아 붓고 있는 핵프로그램을 개발하는 북한의 완고한 태도와 매우 유사하다. 제주 해군기지에 대한 그 지역 주민들의 우려는 이해할 수 있었다. 제주도는 북한과 맞닥뜨리고 있는 전방으로부터 멀리 떨어져 있지만 누구도 이 지역에서 전쟁이 발발할 것인지 예측할 수 없다. 미국의 중요한 공군, 해군기지가 있는 미국령 괌을 향해 북한이 미사일을 발사하겠다고 위협하고 있는데 북한이 제주도 강정마을의 해군기지도 공격하지 않겠는가? 거짓 주장들은 상황을 전혀 개선시키지 못한다. 친북 활동가들은 미국과 한국의 군사훈련이 북한을 겨냥한 것으로 북한에 위협이 된다고 주장하면서 북한의 핵프로그램 개발을 정당화하고 있다. 하지만 군사훈련을 실제로 본 사람들은 이것이 철저히 방어용인 것을 알 수 있다. 대학과 연구소의 이론가들은 이 군사훈련을 중단해야 한다고 주장하지만 그렇게 한다고 해도 북한이 핵과 미사일을 폐기할 가능성이 전혀 없다는 것이 문제다. 제주도 강정마을의 해군기지가 공식적으로 오픈하고 있는데도 자신의 십자군 전쟁을 포기하지 않으려는 이 혈기왕성한 신부의 이를 악물고 싸우려는 결의를 우리는 이해해야 한다. 그는 미군이 제주 해군기지에 주둔한다고 주장하는 북한의 정치 선전에 놀아나고 있는 것이다. 그의 터무니없는 CIA 주장과 관련해서 그는 내가 지난 반세기 동안 기자를 하면서 공개적 혹은 암묵적으로 정부 기관과 연계되는 것을 줄기차게 거부해왔다는 것을 알 필요가 있다. 나는 다시 그를 만나 독립적인 기자로 내 신조를 설명하며 그의 발언들을 적고 싶다. 하지만 그가 나를 향해 “CIA 요원, 꺼져라”라고 외치는 한 그 만남은 이뤄지기 어려울 것이다. 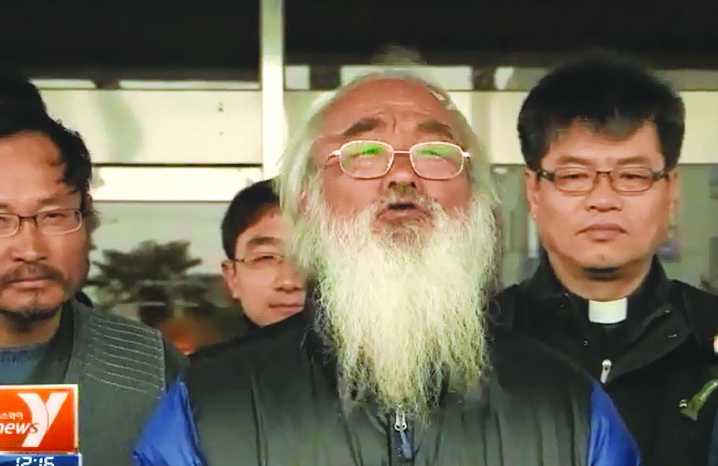 JEJU= I could hardly believe the torrent of angry words pouring from the mouth of the venerable Catholic priest who's been leading the protest against construction of the South Korean navy base on the southern shore of this scenic island province for the past ten years. "CIA, you are CIA" the Rev. Mun Jeong-hyun shouted at me as soon as he recognized me among a group of foreign professors and students who had come to Gangjeong Village while attending a three-day "peace academy" at Jeju University. "CIA, get out, get out." The priest's outburst was not only shocking and embarrassing but also completely puzzling. I had met him more than five years ealier while researching a brief book, "Okinawa and Jeju: Bases of Discontent" comparing the anti-base movements on Japan's southernmost island prefecture and Korea's southern island province. He had gladly answered questions then and on two or three subsequent visits, but now he viewed me as the enemy as he repeated "CIA, CIA" and ordered me out of the workshop on an alley beside the gleaming base where three or four patrol boats were berthed in between cruises. Done with his daily duty of leading protesters at a mass outside the main gate, he was busy carving small stone figures symbolizing his ongoing struggle when he saw me among his visitors. What could I have done or written to provoke such a tirade? I was sure nothing in the book could have offended him, and I told him I doubted he had even read it. No, it was a column I had written for a newspaper that had upset him. I had quoted him as acknowledging the protest had failed in its mission of stopping the base from opening and then had apparently angered him by asking if he really believed American forces were on the base, as he had often claimed. He had responded by denouncing the U.S. as "the axis of evil." What is it that drives this holy man to engage in vituperative attacks with no foundation in fact? How could he shift so easily from prayer to propaganda?What about the ninth of the ten commandments, the one that says "Thou shall not bear false witness??? ?Had the Rev. Mun, in his crusading zeal, forgotten the precepts of holy scripture? Or did he somehow see himself as exempt from biblical teaching that might not suit his purposes as an activist? It's not likely, if I were to encounter Rev. Mun again, that he would do anything other than shout more denunciations in response to efforts on my part at negotiations or dialogue. Those are two words that we often hear in formulations of how to deal with North Korea but sadly are often missing in any serious attempt at reconciliation. Indeed, this priest's response to me shows the obstacles to coming to terms with dedicated activists to whom mindless propaganda is a preferred tool in a long-running standoff that shows no sign of a happy ending, We keep hearing that North Korea wants talks on a peace treaty formally bringing closure to the Korean War, but the North has made clear it will never give up its missile and nuclear programs, and Kim Jong-un has yet to respond to President Moon Jae-in's request to see him. The intransigence of diehard activists parallels the stubborn insistence of North Korea on a program that is costing enormous amounts of money while endangering millions of lives. Still, it's possible to appreciate the concerns of villagers here about a base in their midst. Distant though Jeju may be from the line with North Korea, no one can predict what would happen in a regional war. As long as the North is threatening to fire missiles near the U.S. territory of Guam, site of important American air and naval bases, what's to stop them from targeting the naval base in Gangjeong Village? False charges, however, do nothing to clear the air. Pro-North activists like to claim that the U.S. and South Korea are targeting North Korea, planning exercises that pose a threat to the North, justifying the North's nuclear program, but anyone who has witnessed them knows they are completely defensive. Theorists in universities and think tanks love to talk about a freeze in tests that would do nothing about getting the North to abandon its nukes and missiles. One has to appreciate the grit and determination of a feisty priest who refuses to give up on his crusade even as the navy base in Gangjeong Village opens for normal operations. He plays into the hands of North Korean propaganda, though, by claiming that American forces have anything to do with its existence. As for his CIA nonsense, he needs to know that I have assiduously avoided any relationship with any government agency, overtly or covertly, in half a century in journalism. I would be glad to see him again, explaining my creed as an independent journalist, taking notes on his utterances, but that might be a little difficult as long as he's shouting, "CIA, get out!"